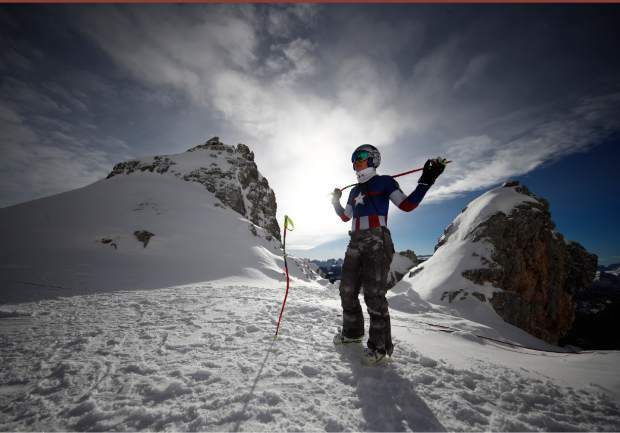 CORTINA D’AMPEZZO, Italy — The Olympic downhill is little more than a month away and Lindsey Vonn is finally ready to start attacking at 100 percent again. Back on one of her favorite courses — she holds a record 11 wins in Cortina — Vonn is not planning to hold anything back entering a set of three speed races this weekend: downhills Friday and Saturday and then a super-G on Sunday. “This snow is perfect. This hill is perfect. I have a lot of confidence here,” Vonn said Thursday after dominating downhill training for the second consecutive day. In both training runs, Vonn’s advantage was nearly a full second — an eternity in ski racing. “Everything is good. I love racing here and it’s always fun for me to be here. It’s beautiful. It’s hard not to be happy,” said Vonn, who is wearing a Captain America themed racing suit this weekend with a big white star on her chest. Aiming to save her best for the Feb. 21 downhill at the Pyeongchang Olympics, Vonn has had only one win this season — a super-G in Val d’Isere, France, more than a month ago. A day after her win in Val d’Isere, Vonn sat out another super-G because she didn’t feel comfortable with the conditions. Then she took four weeks off before returning in Bad Klein. “I feel like I need a little bit more testing but in general I’m ready for any condition,” she said. With the women’s technical events being held before the speed races in Pyeongchang — the opposite from recent Olympics, Vonn will be able to ease her way into the games. She won’t race slalom but may enter the giant slalom to get a taste of the competition before going for gold in the super-G, downhill and combined. “I’m getting more and more comfortable and from here on out it’s just about the timing and hitting my switches in the right spot,” said Shiffrin, who claimed the first downhill victory of her career in Lake Louise in November.